October 15, 2012, 10:45 PM · I'll be honest, not all new works for violin thrill me; fairly often I feel no great desire to hear them twice. But the fully modern Violin Concerto by Esa-Pekka Salonen grew on me fast. The first recording of the piece, called Out of Nowhere, is being released today, and I recently spoke to both Esa-Pekka Salonen and violinist Leila Josefowicz about this concerto and their partnership in creating it. 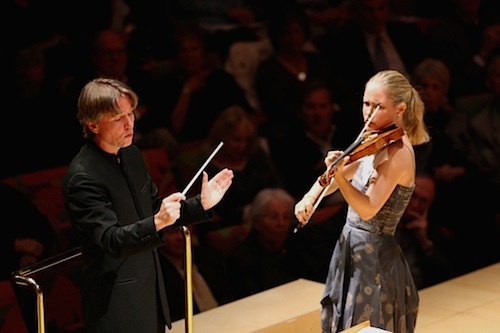 Written in his final months as Music Director of the Los Angeles Philharmonic, Salonen's Violin Concerto was premiered in 2009 by Josefowicz, for whom it was written, with Salonen conducting the LA Phil. The new recording, "Out of Nowhere" is named for the notes the two penciled on the first page of the Violin Concerto. Indeed, the violin seems to come from nowhere to start the concerto, entering alone in a flurry of notes. That flurry becomes a wash of sound, as the orchestra picks up and echoes the violin's motions in the first movement, called "Mirage." The inner movements are called "Pulse 1" and "Pulse 2." The first "Pulse" is full of harmonics, set to the rhythm of lovers' heartbeats in the dark. The second "Pulse" is noisy and rhythmic, perhaps depicting the chaotic culture clash of LA, complete with a drum kit to amp things up. The last movement, called "Adieu," is slow and emotional. 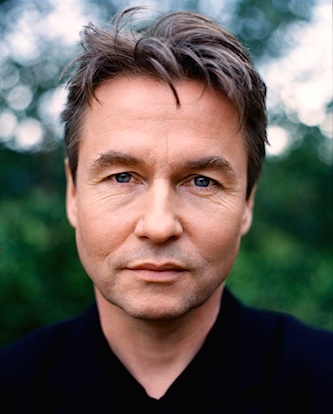 Salonen writes, "For myself, the strongest symbol of what I was going through (during his final months in Los Angeles) is the very last chord of the piece; a new harmonic idea never heard before in the concerto. I saw it as a door to the next part of my life of which I didn't know so much yet, a departure with all the thrills and fears of the unknown." Out of nowhere, into the unknown. It's a piece full of poetry. It's also a piece born of two hard-working musicians at the top of their game. Salonen, after his graceful departure from the LA Phil, in which he left the orchestra in the good hands of Gustavo Dudamel, remains Conductor Laureate of that orchestra and Principal Conductor and Artistic Advisor for the Philharmonia Orchestra in London. Leila Josefowicz has made a reputation as an interpreter of new works, having also premiered works written for her by Steven Mackey ("A Beautiful Passing") and Colin Matthews; and having played first performances of Thomas Adès’ violin concerto, "Concentric Paths". She was awarded a MacArthur Foundation Fellowship for her advocacy of modern works and was featured on the cover of October 2012's The Strad magazine. 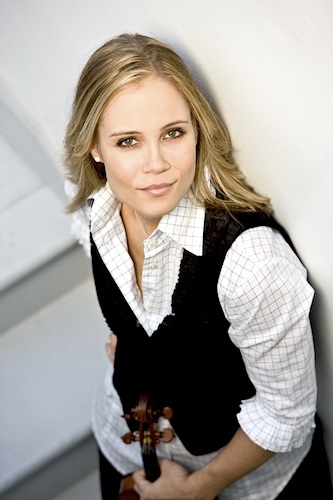 Leila grew up in Los Angeles, during the time when Salonen was Music Director for the LA Phil. Over the years, they performed quite a bit together: chamber music, new music, a choreographed "L'Histoire du Soldat." They performed the Oliver Knussen violin concerto as well as other major performances. And Salonen attended concerts, such as the one in which she performed the John Adams Violin Concerto. It was Josefowicz who first suggested the collaboration -- long before it happened, and before many of their performances together. "I did write him a letter, just saying how much of a fan I am of him, and if he were ever to write me a piece, it would be my biggest dream, and I'd put all my efforts into it…" she said, laughing. "A few years after I wrote my letter, I thought, how else can I show him what effort I would put into a piece, if he were to write me one? And one of the ways in which I did that was to record his piece, 'Lachen Verlernt' For Solo Violin for Warner Classics. It's an 11-minute unaccompanied work, it's very good." When it came to the Violin Concerto, "I knew, I just knew, that if he was going to write something, it would be a big success, and it would be an amazing thing to do with him," she said. "Now, looking back, this has been even more incredible than any of us could have imagined." Indeed, the concerto was met with critical acclaim from the beginning, and Salonen and Josefowicz have taken it on the road, performing the concerto in Paris, Stockholm, Lisbon, London, Berlin, Chicago, Philadelphia, Boston, Brussels, Luxembourg, Dortmund, Ferrara and New York City. Last year, the piece won the prestigious 2012 Grawemeyer Award for Music Composition. For Salonen, Josefowicz "was the most fantastic partner in this," he said. "She's pretty much fearless, she has an amazing technique, and she's very tenacious. Very rarely did I get the kind of feedback that this can't be played, or this is too difficult." Josefowicz did not want Salonen to feel constrained by the limitations of the instrument -- or her ability to play it. "One thing I did NOT want him think about, with me, was technique," she said. "I said, look, forget about any rules you knew about the violin." And he already knew a lot: "I'm not a string player by training, but I know the violin well, obviously, based on the fact that I've been conducting for 30 years, but also I've been married to a professional violinist (Jane Price) for about 20 years," Salonen said. "So whenever I've had violin-related questions in my writing or other works, I just point to my wife and ask, How does this work? When I started writing this piece, I felt I had a fairly good idea about idiomatic violin writing. Of course, I know all the major violin concertos rather intimately as a conductor, so I had this reference as well." "However, I thought that what I would like to do is to kind of stretch the expression of the violin beyond the normal limits. I thought it would be interesting to have as wide a scope of expression and sound as possible, without going into extended techniques -- scratching, and so forth. That's why I wrote the third movement in sort of synthetic disco rock music style…to contrast with the essential lyrical finale of the piece." Josefowicz encouraged Salonen to write whatever came into his head that would get across his ideas, regardless of the difficulty. "I'm the messenger," she said. "I said that I'd tell him if something was truly physically impossible to play." And by impossible to play, she meant impossible, not "difficult." "Those two things are very different," Josefowicz said. "When people said that the Tchaikovsky Violin Concerto was unplayable, they meant that it's very difficult. It's not unplayable. So unplayable would be combining some incredibly high note with some low note that couldn't be played together because the G string and the E string can't be played at the same time." To be sure, we are talking about "playable" for Leila Josefowicz, not necessarily for mere mortals! And even for her, it was a lot of work, in a short period of time. For example, the wickedly fast and intricate first movement. "He got the first movement to me first, thankfully -- because that's a big job, with the notes and the memorization. But the other movements were, too. I was on him, every week, in this process, to get me more material. I was very insistent. And he went with me, he was great, absolutely fantastic. I probably had three months before the performance, when I knew it in my mind already. But I never worked harder, in my life. It was a lot of work." "We were a great team; it was a fantastic example of teamwork and what quality can be accomplished well within a certain time period," she said. "Sometimes, I think this is the way great things are created -- it doesn't always take forever, if two people -- and especially the composer -- have their mind on it." Their process of collaboration had a 21st-century dimension. "We did some of the cooperation over Skype, and a lot of it was done over email," Salonen said. "I would send her little scraps of ideas and phrases to play, then she would play them back for me over Skype sometimes. I had sort of a live laboratory going with her." "There were only a couple times where she said, well look, this really doesn't work very well, and she once had a comment about the form," Salonen said. "I had a different ending for the third movement in my first sketches, and she just instinctively didn't like it. I went back to my studio and I thought, she's absolutely right. I re-wrote the whole thing: the last two minutes or so. It's incredibly valuable to have that sort of feedback. The problem with composing is you're sitting in your studio, alone, and you have no concrete feedback until the first rehearsal. Then, quite often, it's kind of late. You can always correct balance and little instrumental inaccuracies in the course of the rehearsals. But if there's a formal problem, a deeper problem, there's nothing you can do about that, at that point. So I felt really privileged to work with her in this way." One of the things Josefowicz requested for the Violin Concerto was a slow movement. "It was something I requested and will continue to request from composers," she said. "It may be risky, in some ways, for composers to do, because they can't get too fancy. No fireworks, no crazy things going on in the score, but just something very still and very simple. Josefowicz brought up that idea before Salonen had written one note, he said. "A great player can draw some poetry out of one or two notes, just with a subtle change of tone, color, dynamics and phrasing," Salonen said. "She felt that many modern concertos don't offer that option to the soloist; everything is busy and tightly controlled by the composer, so there's no space for individual interpretation. I have had this kind of feeling myself sometimes, over the years. I've premiered about 400 pieces so far in my life, as a conductor. Some of them have been absolute masterpieces and some of them have been absolute crap, and then you know, (he laughs) a whole lot of stuff in between! So I could relate to this." "I thought about my own works, and I thought that what was missing was a big slow movement in the sort of tradition of Bruckner, Mahler, Brahms, and Beethoven," he said. "I'm not trying to compare myself with those guys, but in that sort of vein: a long slow movement that becomes the main movement of the piece, as it does in, say, Bruckner's Seventh Symphony or in Beethoven's Seventh. So that the weightiest emotional and expressive material is in the slow movement. That's what I wanted to do in this case, because I had never done it before." Salonen's slow movement comes at the end of Violin Concerto, his heartfelt "Adieu." "It was written during the time that it really hit me, that okay, my 17 years (as Music Director of the Los Angeles Philharmonic) is coming to an end, and is this the biggest mistake I've ever made in my life, to leave? Or is it something that makes sense and is organic?" Salonen said. "I think a lot of that somehow went into the Violin Concerto. I can't say the bar numbers or anything like that, but when I hear it these days, in my mind it very strongly connects with my last months and weeks in LA. It will always be like that, I think." "I was very, very positively surprised by the reception, and by the fact that orchestras want to program it around the world," he said. "It's very encouraging, and also, somehow it tells me that the genre of sort of the big, virtuoso instrumental concerto is not over. There's still life in the old horse, and we should keep writing music." For violinists wishing to take up the concerto, there is a piano reduction of the orchestra part, Salonen said, and the score is almost ready for final print. The concerto has been played by a few other violinists already, including Patricia Kopatchinskajas, Thomas Zehetmair and Pekka Kuusisto. Also, Akiko Suwanai will perform it in February 2013 with Philharmonia Orchestra in Tokyo; and Julia Fischer will perform it with Vienna Philharmonic in May 2013. "So it's kind of leaving home these days," he laughed, "which is nice, but at the same time it's a rite of passage. It really is out there, no longer in your hands. You lose control over the piece because you're no longer there to guard it! That's a healthy, normal situation, and of course I'm privileged to have all those people play it." If you are interested in "Out of Nowhere," the recording of Salonen's Violin Concerto and orchestra piece, "Nyx": here is the iTunes link and the Amazon link. October 21, 2012 at 10:49 PM · Great piece, Laurie.